A modestly budgeted, cannily made survival drama centered on a fictional coal mine explosion in Appalachia, 'Mine 9' plays a little like a humble blueprint for a more extravagant Hollywood exercise in high-octane heroism: Squint a little, and you can see how Peter Berg and Mark Wahlberg, say, would muscle out the solemn, simple narrative devised here by writer-director-producer Eddie Mensore. That's not a criticism of 'Mine 9', which is most interesting for the ways it avoids the standard gung-ho dramatics of a disaster movie, treating its male ensemble as heroes and victims in equal measure. Neither is it a stringent exercise in docu-realism, however, as a streak of heartland sentimentality runs through its gritty tragedy. Dedicated to the hard-up coal-mining community in the closing credits, Mensore's film aims chiefly to highlight the typical plight of an American underclass that rarely gets big-screen attention. That it does with honesty and conviction, if not a great deal of inspiration. 'Mine 9' will surely resonate with audiences in the US coal belt, where its limited theatrical release is being concentrated; elsewhere, it's a niche, streaming-bound item. Though it hasn't been drawn from specific real-life events, Mensore's script keeps characterization and dramatic complication to a bare minimum, as if to stress how easily what transpires on screen could be true. Every man here is an everyman, and the harrowing ordeal they endure across a very lean 83-minute runtime – including a full ten minutes of credits – is portrayed in such blunt, straightforward terms as to suggest this is hardly a remarkable incident in a troubled, dangerous industry. It's effective enough in that regard, but still, 'Mine 9' could stand more human nuance and environmental detail: Its evocation of the real lives and families imperiled by irresponsible authorities is cursory at best. Mensore sets the claustrophobic mood immediately with a tense false alarm, as hazardously high methane levels in one mine cause a nerve-jangling flare-up. The grimy darkness and tight framing of Matthew Boyd's cinematography play up the panic and confusion felt by the miners affected, in a space hardly conducive to clarity and communication in the face of danger. 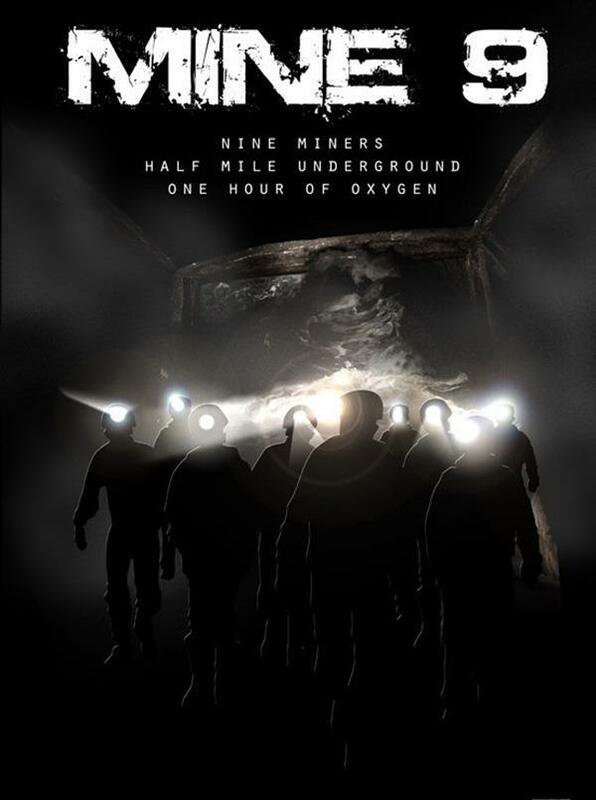 Afterwards, the men debate how to follow up on this near-catastrophe: Team leader Zeke (Terry Serpico) wants to report the incident to safety monitors, but his colleagues would rather take the risk and let it slide, fearful that an investigation could shut down the mine and cost them their livelihood. Slightly declarative, on-the-nose dialogue maps out the men's differing positions in a cruel working-class bind: One even points out that, from an economic perspective, they're more use to their families dead than unemployed. No prizes for guessing that this gamble backfires sooner rather than later – on the very day that Zeke's teenage nephew Ryan (Drew Starkey) reluctantly joins the crew for his first day down the shaft. Mensore sketches in the dire socioeconomic circumstances that have narrowed Ryan's life choices down to following in the soot-trailing footsteps of his uncle, as well as his callous father Kenny (Mark Ashworth), though the scant above-ground action in 'Mine 9' would benefit from a little more observation and texture: There's little sense of who these men really are, beyond their arduous labor. Soon enough, at least, we get to see their most visceral individual instincts, when a full-on methane explosion occurs – collapsing the mine and killing several men instantly. The survivors, meanwhile, have less than an hour's worth of air left while they figure out their escape, making some grisly life-or-death decisions along the way. Playing out nearly in real time, it's a tension exercise rightly shorn of any sense of macho exhilaration, anxiously realized with limited means. Production designer Tim Barrett and visual effects coordinator Anaitte Vaccaro (both of whom also take executive producer credits) work around evident budget constraints to convey a vivid sense of murky, crumbling space, as escape routes are shed and sealed off by the minute. The actors do what's required of them with appropriately clenched jaws, though Mensore's script isn't designed to let any of them especially shine. Rather like the crisis depicted on screen, this is an all-for-one-and-one-for-all affair, inviting viewers not to identify with particular characters as such, but to place themselves in the men's heavy steel-toed boots, sweating it out with them to the bitter, throat-closing end. NEW YORK: Jon Favreau gave fans their first look at the 'The Mandalorian' at the Star Wars Celebration in Chicago on Sunday, previewing the most anticipated series yet from the galaxy far, far away. Favreau's eight-episode series will debut on the Disney-Plus streaming service on Nov 12. It's set in the aftermath of 'The Return of the Jedi', taking place five years after the Rebellion's victory. Favreau called himself 'a product of a Star Wars imagination' who was eager to plunge into the post-'Jedi' landscape. 'You have vestiges of the Empire. You have only the strong surviving. You have chaos taking over the galaxy,' Favreau said.